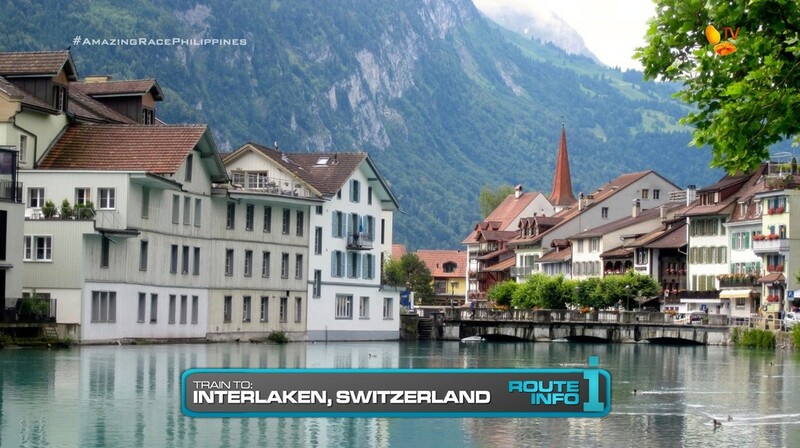 Teams begin the 9th Leg by hopping on a train to their next destination: Interlaken, Switzerland. They must take a train from Frankfurt to Basel and then from Basel to Interlaken, arriving at 7:22am. Teams must make their way to Kleine Rugen Wiese where they must transport four 50-pound wheels of cheese from a cheese shed to the bottom of the hill using traditional, but flimsy, carrying contraptions. 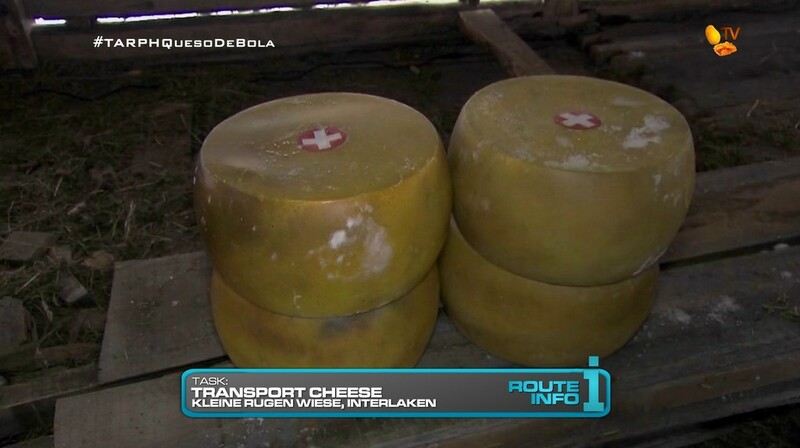 Once they have all four cheese wheels nicely stacked, they will receive their next clue. 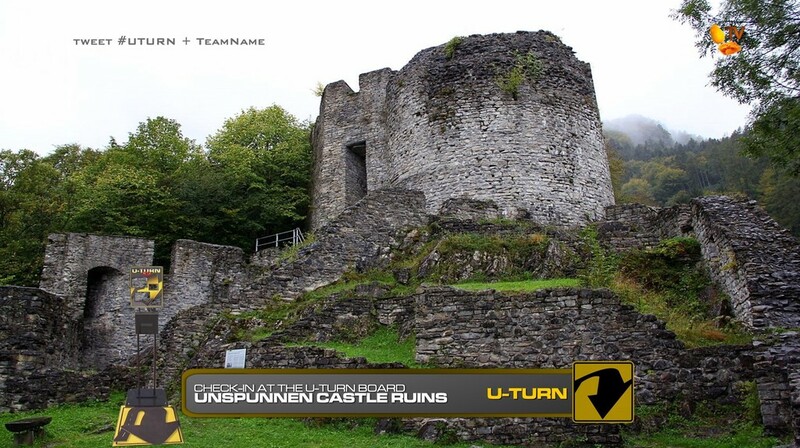 That clue directs teams to the grounds outside Unspunnen Castle where they will find the Detour: Steinstossen or Jodeln Meister. 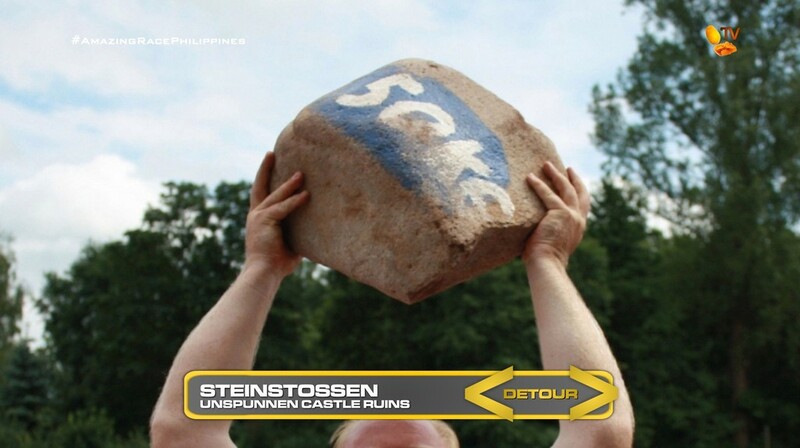 In Steinstossen, teams must play the Swiss version of stone put by tossing a 22-25 pound stone along the ground until they reach the finish line. Each team member must be able to do it within five tosses or they will need to begin again. In Jodeln Meister, teams must learn how to yodel a specific tune by listening to a master yodeler. When the world champion is satisfied, they will receive their next clue. For both Detours, teams will dress in traditional Swiss clothing which they will wear for the rest of the Leg. 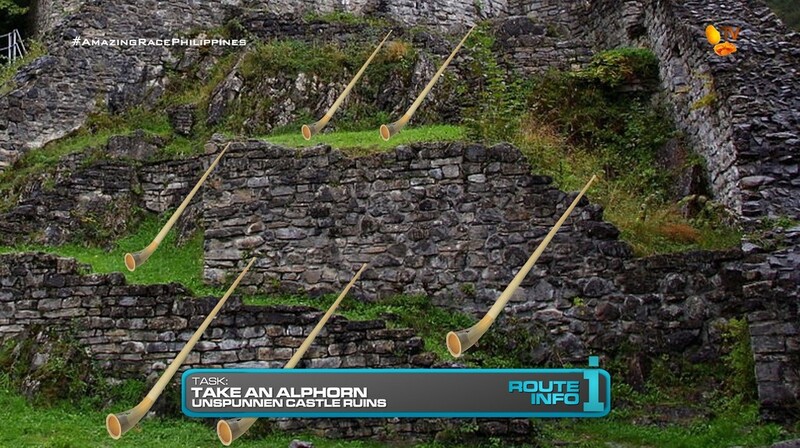 Before leaving Unspunnen, teams must check-in at the Double U-Turn where they will also pick-up an alphorn which they must keep with them until further notice. Teams must now take a train to Grindelwald. Upon arrival, teams must walk to the Gletscherschlucht. Entering the ravine, teams must find a flagged spot where they will blow the alphorn they’ve brought with them. Once they do, they can get their next clue. That clue reveals the Road Block: Who is feeling heroic? 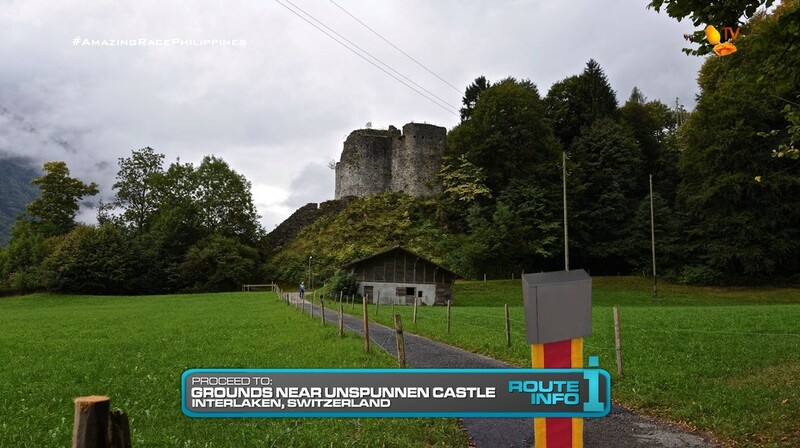 For this Road Block, teams will make their way on foot to a nearby field and relive the story of Swiss hero William Tell. Using the apple they received in Wilhelmsfeld in the last Leg, they must use a crossbow to shoot it off a child’s head. (That child will be a stuffed dummy of course.) The arrow must, at the very least, hit the apple and leave a mark before falling off. If teams do not have their apple, they must serve a 30-minute penalty before being given a new one. 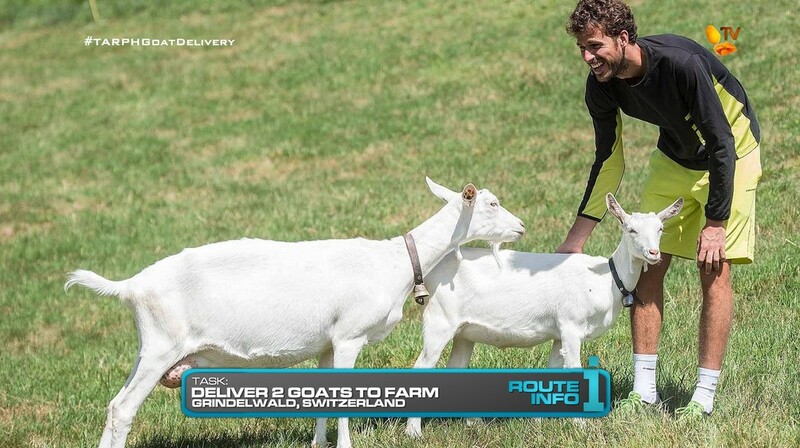 Once teams complete the Road Block, they will be given two goats which they must deliver to a nearby farm up the hill. 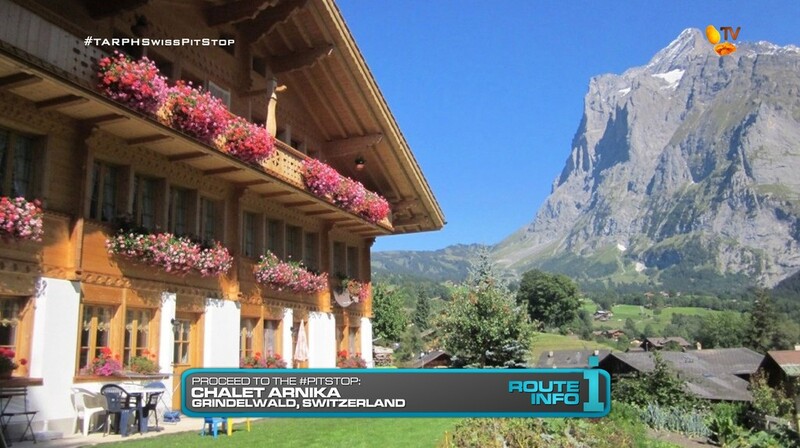 After delivering the goats, they can head to the Pit Stop: the Chalet Arnika. This turned out to be a great Leg! Switzerland is a logical next destination by train after Germany. 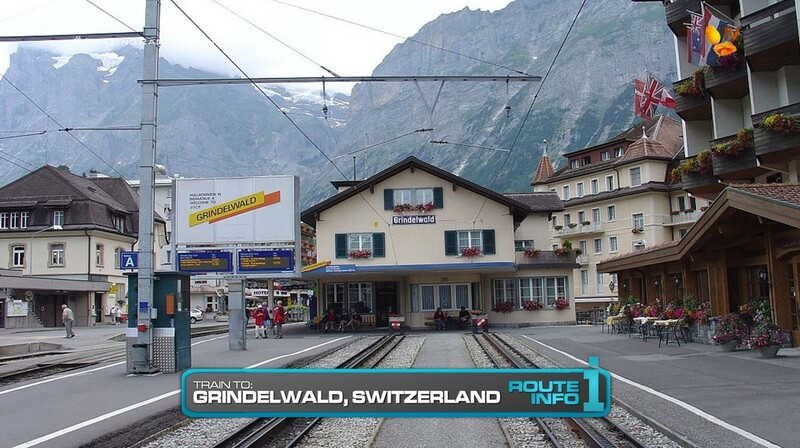 And Interlaken/Grindelwald definitely has plenty of great tasks to recycle! The cheese is definitely one of the most memorable TAR tasks ever. The original TAR14 task was better than the TAR22 Switchback. And this isn’t going to be a snow Leg, so the carrying contraptions should provide much more fun. Though dragging the cheese on sleds could still be a possibility. This will definitely be a European countryside Leg. 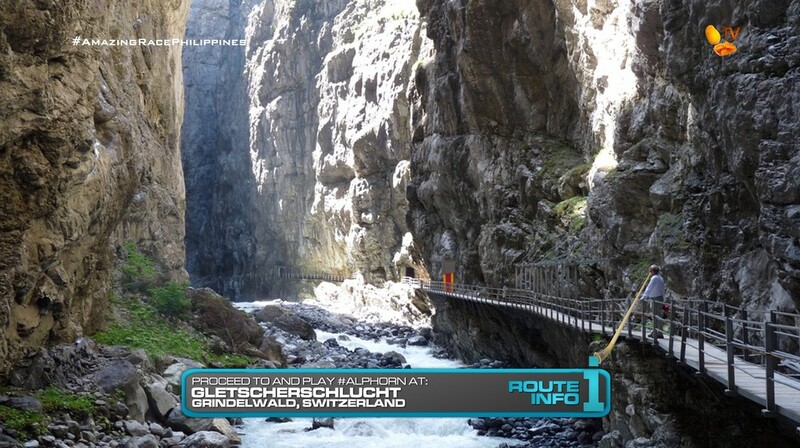 The Detour is very Swiss and the landscape will be visually great, especially on Philippine TV. And with the tasks right next to each other, it’s a good place for the final U-Turn. The alphorn is just an amusing extra task for the teams. And it’s become a TARPHDME staple to have teams taking care of different objects during a Leg. The Gletcherschuct is a good place to blow that alphorn. Plus it’s great to have as many TAR3 callbacks as possible. Which is why we also have the same Road Bock. I don’t remember having any archery-type of task on TARPH yet, so this is as good a place as any. And that apple from last Leg is a nice little twist. Being in this area, there’s an opportunity for teams to play with goats, so why not? Hehe.